NEW PROFESSIONAL HEAVY DUTY TV MONITOR STAND w/ Locking Wheel Base. Standard design for easy operation. Features heavy duty rigid sturdy steel construction. Non-reflective professional matte black finish. Also, accessory tray is recessed to hold drinks conveniently. Fits TV Size 13" - 19". 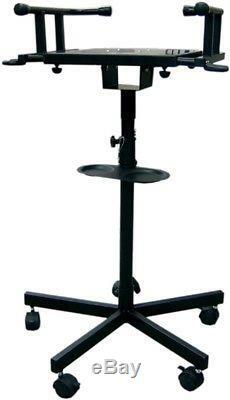 Height 85-145cm (33.5"-57") - Adjustable. Base: assemble type (wheels with lock for each wheel). A customer RA number must be issued before we can except any return. The item "NEW PROFESSIONAL HEAVY DUTY TV MONITOR STAND with Locking Wheel Base" is in sale since Thursday, May 12, 2011. This item is in the category "Consumer Electronics\TV, Video & Home Audio\TV, Video & Audio Accessories\Home Audio Accessories\Speaker Mounts & Stands". The seller is "andreasinc" and is located in Palm Harbor, Florida. This item can be shipped to United States, Canada, United Kingdom, Denmark, Romania, Slovakia, Bulgaria, Czech republic, Finland, Hungary, Latvia, Lithuania, Malta, Estonia, Australia, Greece, Portugal, Cyprus, Slovenia, Japan, China, Sweden, South Korea, Indonesia, Taiwan, Thailand, Belgium, France, Hong Kong, Ireland, Netherlands, Poland, Spain, Italy, Germany, Austria, Mexico, New Zealand, Philippines, Singapore, Switzerland, Norway, Ukraine, Croatia, Malaysia, Brazil, Chile, Colombia, Costa rica, Dominican republic, Panama, Trinidad and tobago, Guatemala, El salvador, Honduras, Jamaica.